Saying “no” also means no longer doing things because we have to. Notice the kinds of things we say we have to do. Chores. Meetings. 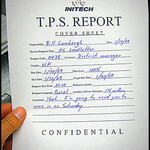 TPS reports. The truth is, we never “have to” do anything. We can choose to do the TPS report or not. We can choose to do any task or not. This is true for all of us, all of the time. Yes, there are some things we choose to do because we dislike the consequences of not doing them. You see, there is a world of difference between doing a task because we think we “have to” and choosing to do that same task because we prefer the outcomes of having done it.